Even God took time to rest when He created the world! God worked for six days and rested on the seventh, consecrating this day to rest. In the Gospels, Christ tells us that the Sabbath was made for man (Mark 2:27), so we ought to recognize our human need for rest. Retreats allow us to dedicate time to the Lord and restore ourselves so that we might be better disciples of Christ. Without this necessary and holy rest, we are quick to burn out in our missionary work as disciples. Throughout the Gospels, Christ periodically takes time to step away from the world, and even from His disciples, to be alone with His Father. Jesus knew that after pouring Himself into His ministry, He needed to fill Himself back up by spending time alone with the Father in prayer. 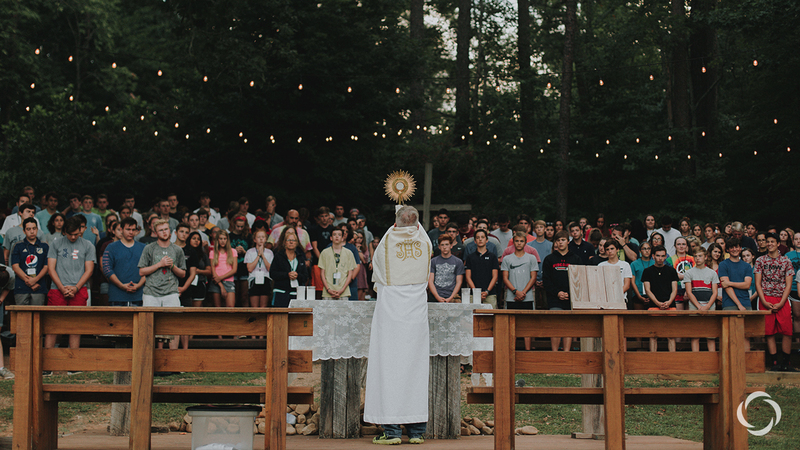 Retreats give us the same opportunity to fill ourselves back up by emulating Christ, Himself, and reconnecting with God in personal prayer. Retreats are perfect opportunities to build community with people, especially people who also care about their faith. Friendships made on retreats are most often formed around a mutual love for Christ, and these relationships are the ones that will get us to heaven. Although you may not know everyone going on the retreat, you’ll get to know them quickly through spiritual sharing, reflections and talks, the sacraments, messy games, and what have you. Friendships centered on Christ will change your life, and a retreat is a perfect place to foster these relationships. While on retreat, we sometimes seem to be in another world. The days seem longer, as they’re packed with prayer and activities, and the nights, where we encounter God in the sacraments or foster deep conversations with old and new friends, seem more beautiful. But, this otherworldly feeling isn’t just in our heads. While on retreat, we live on God’s time, also known in Greek as Kairos. While adhering to a schedule focused on our heavenly Father, we do everything in a different light and for a different reason. Retreats give us the chance to step out of our normal routine and live on God’s time, consecrating every moment to Him. While retreats have the potential to change our lives in the future, they also give us a chance to look back at our past. Many retreats encourage us to reflect on who we have been, who we are now, and who God desires us to be in the future. Most of us probably don’t have the time to sit down every day and meditate on who we’ve been in the past, but retreats give us this opportunity. By reflecting on who we’ve been, we can better understand who God desires us to become. Retreats give us a unique opportunity to concentrate on prayer more than we do in everyday life. Prayer on a retreat may be with other people, individually, through the sacraments, or a combination of these. The deeper prayer experienced doesn’t come because there’s a special Jesus that we only meet on retreat. This prayer happens because we’ve removed ourselves from our day-to-day routine and can listen to God more closely. Retreats can wreck us. Images we had of God can be transformed and relationships we thought were good can exposed as bad when we connect with God on retreats. Stepping into God’s love for a retreat weekend might reveal to us a relationship we need to change, a prayer style we ought to alter, or a perspective we hadn’t yet seen about a life decision. Now, this isn’t to say that we should expect to come back from every retreat a totally different person; that probably won’t happen. Nonetheless, while on retreat, we should keep our minds and hearts open to the ways in which God might be trying to wreck us in order to build us back up anew. Many retreats offer opportunities clear our lives of obstacles that block us from loving God fully by receiving the Sacrament of Reconciliation. Retreats may also give us the chance to reconcile with others through prayer and conversation. In the same way that retreats allow us reset our rhythm of life, the gift of the Sacrament of Reconciliation gives us the chance to clear our lives of the sin that separates us from God and others. Whether or not Reconciliation is included, retreats offer crucial opportunities for us to reconcile with God, others, and ourselves. If we take our Christian lives seriously, we realize that we were created not only to receive Christ in our own lives, but also to share Him with others. We don’t have to go on a mission to a foreign country to be effective disciples; we can answer Jesus’ call to be missionary disciples by sharing Him with those we’re closest to. Missionary discipleship requires that we pour ourselves out to those we serve, but, we must fill ourselves back up to continue serving effectively, just like Jesus did. Retreats allow us to refocus our gaze on Him and reunite our efforts to His Spirit, enabling us to persevere in our mission as disciples. Retreats will not magically transform our lives from a messy heap of confusion to a beautiful lives-of-the-saints stain glass window. However, retreats can show us how to change our own lives. Through meeting people on fire for their faith and encountering the Father in new ways, we gather the spiritual tools needed to truly transform our lives and give ourselves to Christ. In stepping away from the world and leaning into God’s love, we have an amazing opportunity to understand our faith in a whole new way and claim it as our own. Retreats can be the crucial beginnings to a transformative journey with Christ. Have I convinced you to go on a retreat? If you answered no, that’s all right; God will reveal Himself to each of us in His timing. Nonetheless, I urge you to pray about making a retreat and see how your heart moves in response. God has great things in store for you, and a retreat might just be the next step in your journey of faith!